Architects hired to rethink design of the block-long bunker. The people of Smoketown have been ignored. 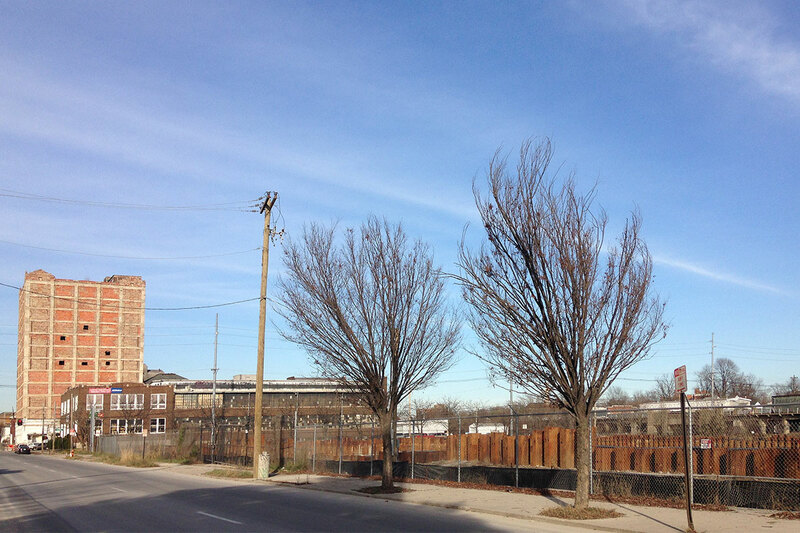 As one of twelve neighborhoods scheduled to receive a combined sewer overflow (CSO) basin, the Metropolitan Sewer District (MSD) has designated Smoketown as the only site to receive an above-ground, concrete structure equipped with water pumps—all of which could very easily be placed underground and covered with green space. However, the underlying issue is not just the basin itself, but how the construction process was handled. Cummins is referring to the 40-foot-deep hole on the corner of Logan Street and Breckinridge Street, and to the months-long process of dynamite blasting that it took to make it. 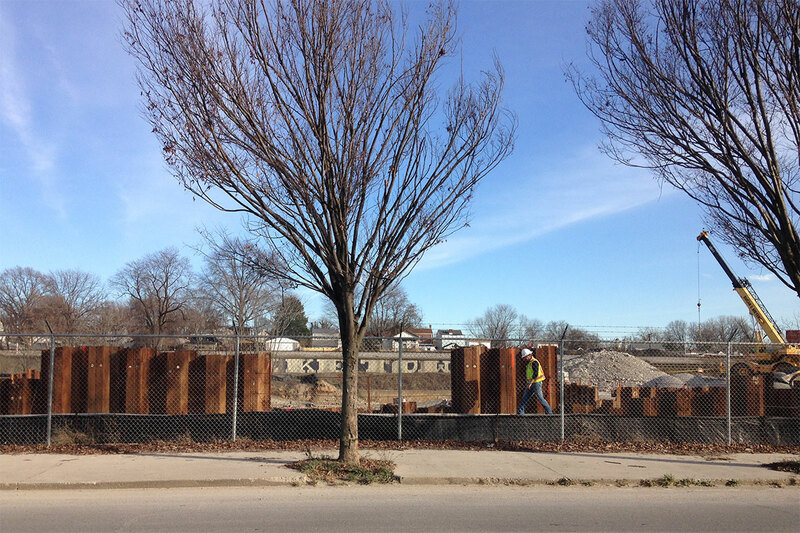 The Logan Street CSO Basin is intended to prevent sewage overflows from pouring into Beargrass Creek and ultimately the Ohio River. The basin site is surrounded by shotgun houses that have impressively retained their original details and iconic fish-scale shingles. 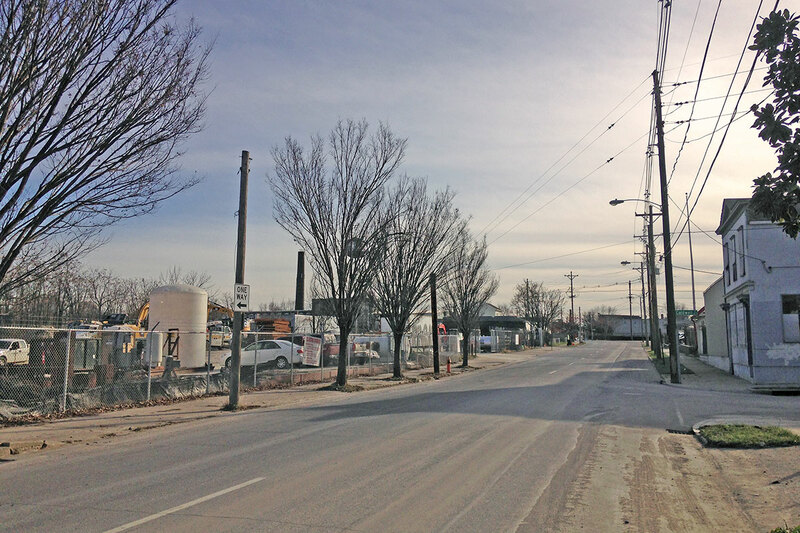 In a weeks-long process of talking with residents living adjacent to the blasting zone, there seems to be a real sense of dread regarding the project. Every resident I had spoken with has reported damage to their homes as a result of the construction, which they worry will reduce property values and ultimately destroy the already-fragile housing stock in the area. One resident in particular, who wished to remain anonymous, said that their parcel was valued at $7,000 not long before MSD started the project, but is now worth only $1,500. MSD spokesperson Steve Tedder confirmed the agency has received calls from residents reporting blasting damage, but that it was being handled according to their claim procedure. This meant the property damages would need to be evaluated by their contractor, Walsh Construction Company, before any compensation could be provided. Residents who called MSD with damage-related complaints said they were told they had to provide photographic evidence directly linking the property damage to the blasts. In other words, they needed a before/after photo in order to receive any compensation. At the time of this publication, MSD has not provided any reimbursement for the alleged damages. Representatives at Walsh Construction Company declined repeated requests to comment. Concerns about the long-term effect of the CSO basin have been growing. Local media coverage regarding the project have centered on the fact that Smoketown—a neighborhood plagued by disinvestment and political neglect—is not getting the same treatment as other neighborhoods with identical basin developments. At a recent Smoketown neighborhood meeting, a representative from MSD asked what kinds of adjustments should be made to the CSO design. Overwhelmingly, the people demanded that the entire basin be buried below ground and covered with a park or some other kind of green space. A cursory glance down Logan Street will show that nearly all the houses along the corridor—directly across from the construction area—have been boarded up. Most are for sale. Today, many residents harbor suspicion over the project and what MSD has planned for the neighborhood. In talking with members of the community, the prevailing notion seemed to be that the cultural heritage of Smoketown has not been respected and the voices of the people have been ignored. In order for MSD or other government agencies to gain support for large-scale projects of this type, more deference needs to be given to neighborhoods and the people that have lived there for generations. That Logan St plot was certainly an eyesore before the construction began, and the trucks and the blasting were probably unavoidable for this project. But it’s still disgraceful that this one location is the only one not being built to grade. The only explanation can be that the city doesn’t care about this neighborhood. I agree with Matt: That only one basin was built above ground, without any type of even evasive explanation other than “we just didn’t do it,” is absolutely ridiculous and unacceptable.